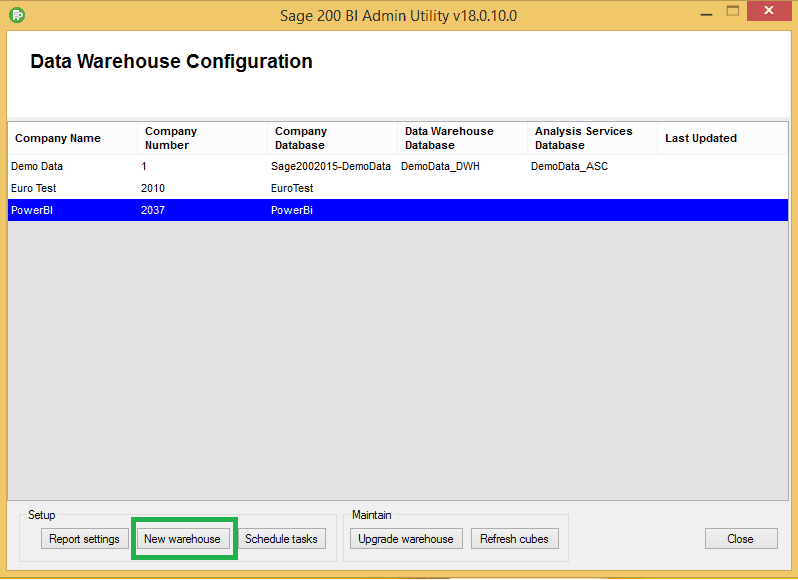 In my opinion, one of the best things about Sage 200 is the Business Intelligence Module. As a business, reporting is key and Sage BI gives users the freedom to create and edit reports based on the masses of data you have in Sage. Here, we are going to go through the questions our Support Team get asked most frequently and of course, the solutions! Why am I getting an error message that says “Reporting data does not exist”? 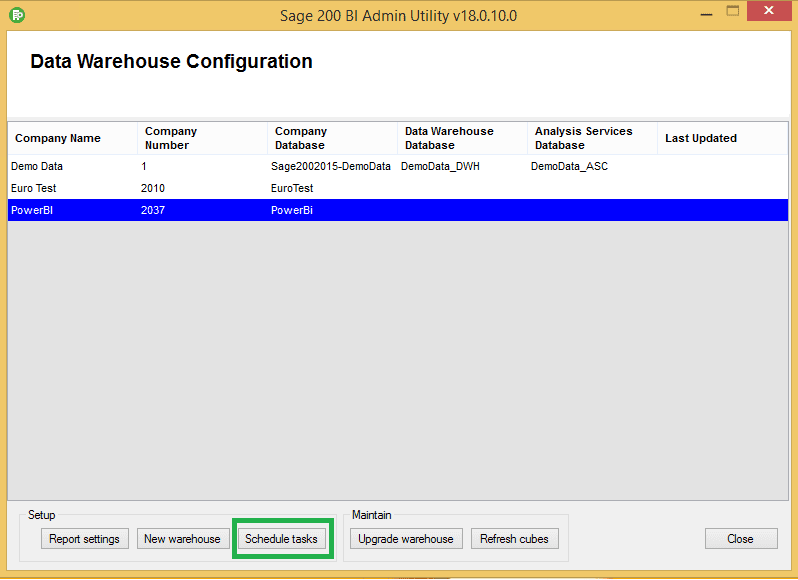 Sage 200 BI runs off Data Cubes. This basically means that your Sage data is taken and stored in a Data Warehouse, this is then broken down into Cubes. For example, all your financial data will be in one cube, all your sales data in another. This error occurs when you don’t have your cubes set up. To set these up, you will need to open Sage Business Intelligence Administration. Pictured below, you will see the New Warehouse function. To set up your cubes, you simply need to click this button. Why can’t I open the Balance Sheet or Profit and Loss Reports in BI? In order to be able to use these reports in BI, they have to be set up in Sage. To set up your financial statements in Sage 200, you must head to Nominal Ledger > Utilities > Ledger Set Up > Financial Statement Layouts. For further help on setting up your Financial Statements, click here to download our free user guide! You can also specify within Business Intelligence administration which reports are selected as default by selecting the required company and selecting the button at the bottom of report settings. Why isn’t the data in my BI Reports isn’t up to date? When BI is set up, there is also a scheduling task that needs to be set up. This tells the system to pull the data from Sage and push it into your Data Warehouse. In short, it is refreshing the data cubes. This is usually set to happen overnight, as it can be a lengthy process! If your data isn’t up to date, the first thing to check is when it was last updated. To do this, head over to the Sage Business Intelligence Administration. If it hasn’t been updated overnight, you can set up the schedule by clicking the Scheduling Button on the Sage Business Intelligence Administration. I saved a report, and now when I open it there is no Data… help! When saving reports in BI, it is important that you save with the correct file type, use the correct function and locations. For more information on saving your BI reports, you can check out our blog here! Another thing to check is that you have the Sage BI Toolbar enabled in Excel. If the Sage BI Tab isn’t there, within Excel you can go to File > Options > Add-Ins and change the drop down at the bottom to COM Add-ins. Here you will need to tick both Sage 200 options as below! 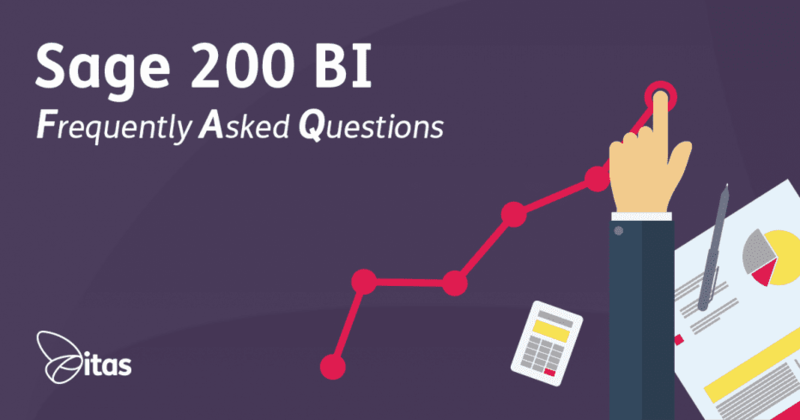 So there you have it… our most frequently asked questions relating to Sage 200 BI and their solutions! If you would like to learn more about Sage Business Intelligence, download our free Business Intelligence brochure below.